Six of us, Paul Ericson, Ray Gable, Jeff Johnson, Allen Mitchell, John Munns and Kathy Dollar, headed out under a sunny sky. We rode Yellow Springs to Walter Martz to take advantage of the new circle and bike lanes and then headed out Ford to Bethel so we could climb Putman. 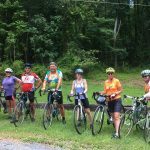 Terry’s Dispatch: Today’s Monocacy Middle Ride (August 5) was a peel-off ride. We started out with 10 people: Kayla Hutchins, Vicki Crum, Kathy Dollar, Ray Gable, Ian and Lynne Hewitt, Jeff Johnson, Allen Mitchell, Bruce Thetelman and myself. Terry’s Report: The August 4 Covered Bridges Ride was most enjoyable. We rode with no threat of rain and warm weather…a wonderful day! 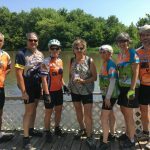 Paul Ericson, Terry Eskuchen, Judy Goffi, Kayla Hutchins, Wendy Morris, Diana and Lee Rabideau, Dottie Stratton and Kathy Dollar enjoyed a 20 mile ride Sunday. 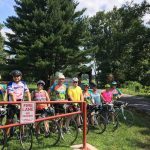 Eight of us rode from Baker Park in Frederick today, July 14, 2018, to Lilypons Gardens in Adamstown.